Raymond POND SDVOSB JV, LLC has been awarded the Architectural & Engineering IDIQ contract for Central Alabama Veterans Heath Care System (CAVHCS). Raymond Engineering (Raymond POND SDVOSB JV) provided Professional Architectural/Engineering services to verify existing conditions, design and prepare contract working drawings and specifications for repair or replace roofs on Buildings 3, 3A, 4A, 5, 65, 83, 88, 97 and 120. 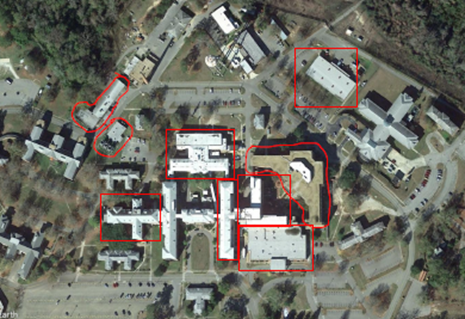 The project corrects roof deficiencies that were identified in the 2016 Facilities Condition Assessments (FCA) for Central Alabama Veterans Health Care Systems-East (CAVHCS-East).